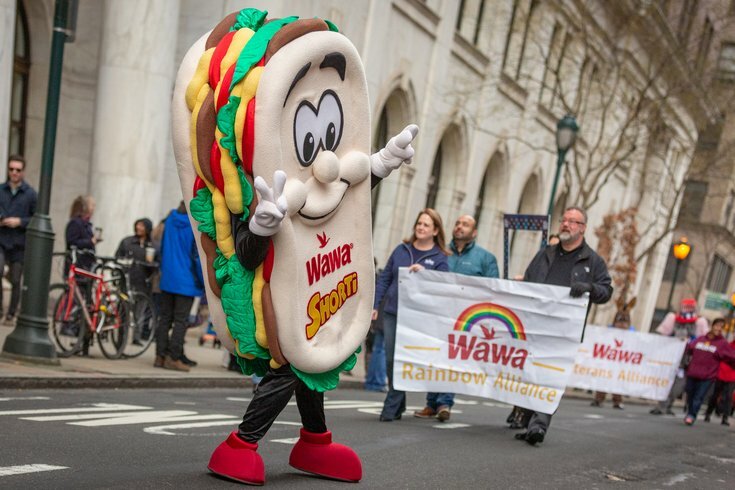 Wawa mascot, "Shorti" was part of the parade on Chestnut Street during the celebrations Friday Morning. 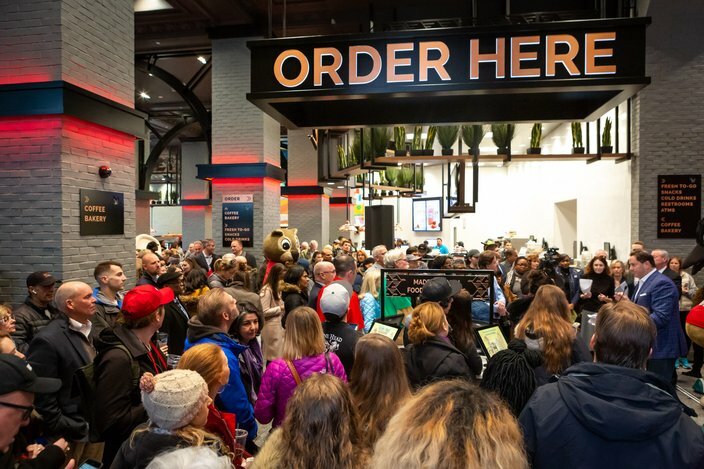 Wawa store number 8131 opened its door early Friday morning, unveiling to the general public the largest store in the iconic chain's history: a massive 11,000 square feet, eclipsing the Washington D.C. store. 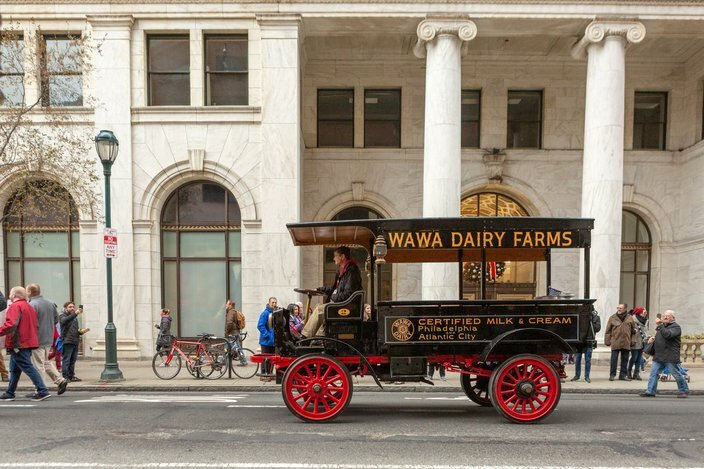 The new store, at the Public Ledger Building at the corner of 6th and Chestnut, features a pair of murals created specially for the new store in partnership with the Mural Arts Program, seating areas, a "living greenery wall," Wawa merchandise, as well as food and beverage items that you won't find elsewhere. In addition to a ribbon cutting ceremony there was a hoagie making contest between the Philadelphia Police and Fire Departments, and remarks from Philadelphia Mayor Jim Kenney. To continue the grand opening feel, this Wawa will be offering free coffee throughout the weekend. 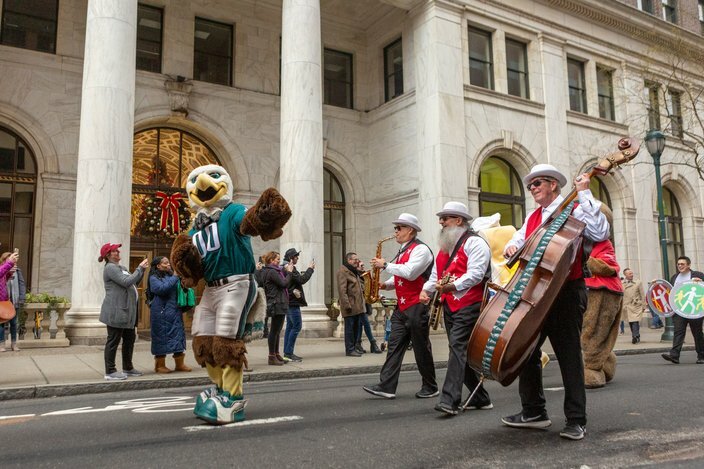 Swoop and other local mascots danced while parading down Chestnut Street to the grand opening celebration. 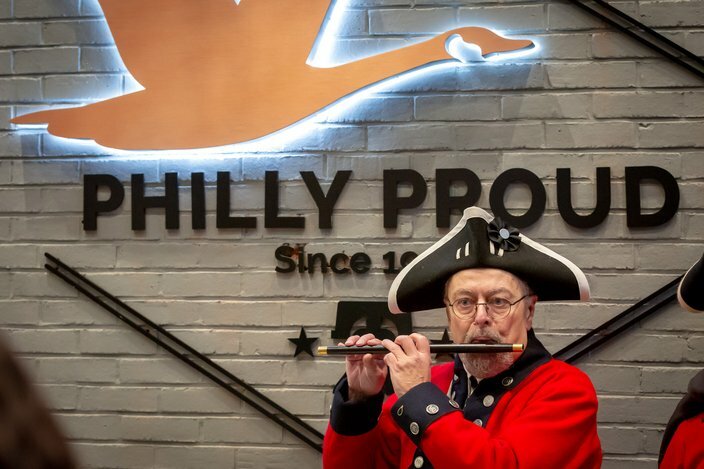 “This is definitely the most gorgeous Wawa” said storyteller for Historic Philadelphia and former Wawa hoagie maker, Jenna McLaughlin, at the grand opening celebration, Friday, Dec. 14, 2018. Wawa President and CEO Chris Gheysens said construction was done in 131 days. 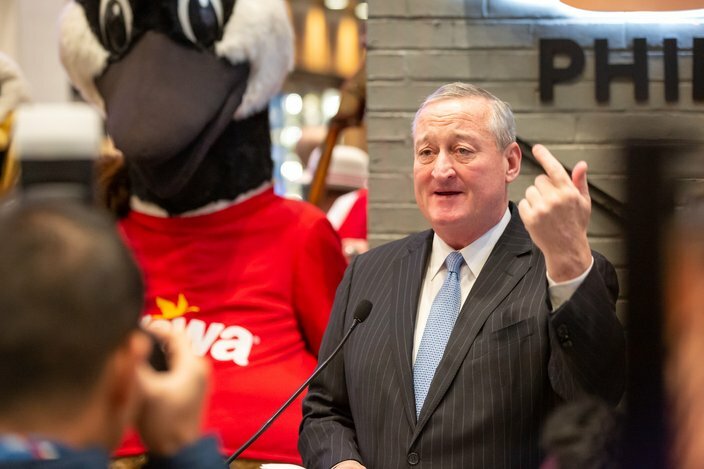 Philadelphia mayor Jim Kenney welcomed the Wawa to the Sixth and Chestnut location and thanked the company for their commitment to the City of Philadelphia during the grand opening celebration. 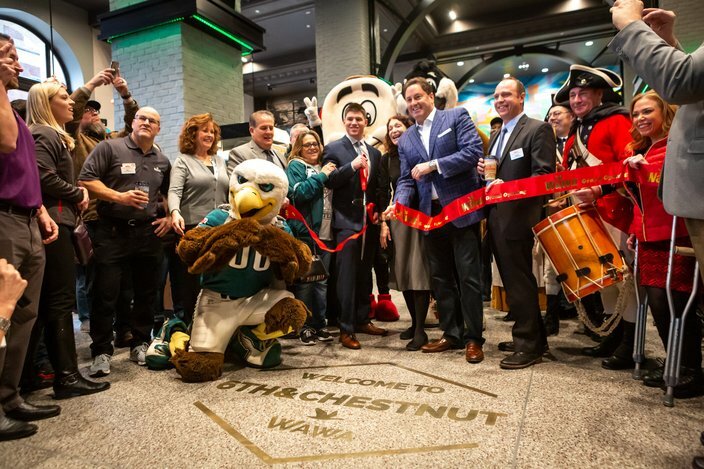 Hundreds attended the grand opening celebrations at the Sixth and Chestnut store. 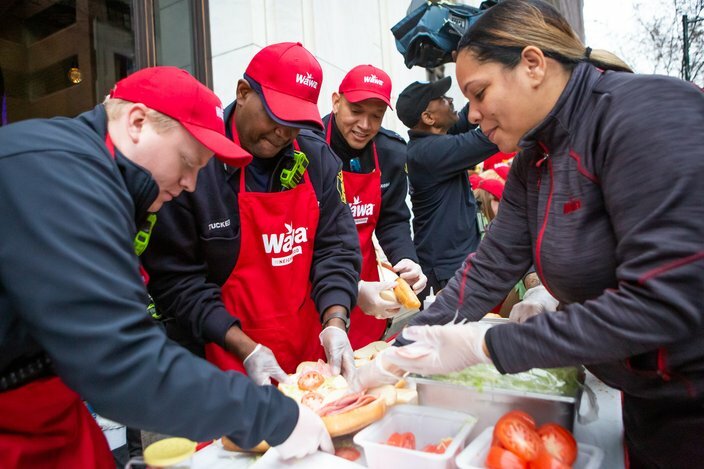 The Philadelphia Fire Department competed in a hoagie making competition at the grand opening celebrations, Friday, Dec. 14, 2018. 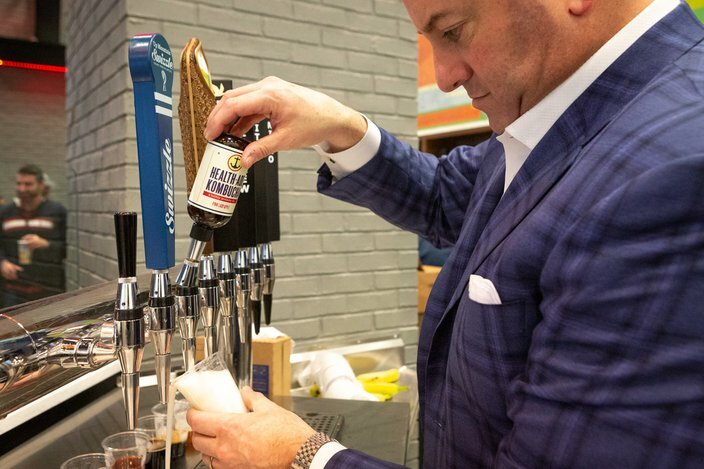 Wawa President and CEO Chris Gheysens pours a kombucha from the tap in the specialty drink corner of the flagship Wawa location.